Muzzles can help curb lousy behavior including barking, biting, chewing and nipping. 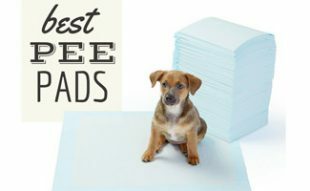 But there are various types of muzzles depending on your needs, their breed, specific behavioral issue and more. I used a muzzle on my dog for walks because she had a habit of barking obsessively and lunging at other dogs we passed on the trail. Before I took her on a walk wearing the muzzle, my husband got her used to the muzzle by doing the following. Let the dog sniff the muzzle to show them that it’s not bad. Give a treat (like Zuke’s training treats). Repeat this a handful of times. Touch nose to the muzzle and give them a treat. Continue to do this until they show positive interest in the muzzle. Hold the muzzle in front of their face with one hand and hold a treat with your other hand so they have to put their nose inside to eat the treat. Repeat this until it is easy for them to do. Slide the muzzle onto their nose and treat them. Remove the muzzle and repeat this a few times. Place the muzzle on your dog and fasten it. Treat them and remove the muzzle. Repeat a handful of times as you slowly build up the time you wait to remove the muzzle. Remove the muzzle when it is not needed. You should never leave it on for long periods of time or when unsupervised. Cesar Millan says muzzles shouldn’t be worn for longer than 20 minutes, depending on the temperature and how active the dog is at the time he’s wearing it. Honestly, it depends. Muzzles are often used for training and walking, which can both take longer than 20 minutes at a time. We’re not saying you should buy a muzzle then put it on your dog for an hour the first time. It will take time to build confidence and acceptance with your dog. Personally, walks with my dogs last anywhere from 30 to 90 minutes (depending on the weather). When we go to training classes with her wearing a muzzle and they are typically longer than two hours. If I had to limit myself to just 20 minutes, we’d have to decrease our walks and training sessions. While we don’t agree with Cesar’s Way, we also don’t think it’s right to leave the muzzle on for too long. We suggest only having the muzzle on for potentially stressful situations, like going to the vet, taking a walk or meeting someone new. Also, anytime a dog is wearing a muzzle, a responsible adult should be around to supervise and make sure the dog is tolerating it well. If your dog tends to bark while you’re walking it, a no bark muzzle may help keep it calmer. Your dog will still be able to breathe freely and pant their heart out. The muzzle will keep your dog from biting or eating items it shouldn’t. The muzzle is lightweight and durable and is available in small, medium, large and extra-large. You can also purchase it in brown or black leather. If you need a dog muzzle to stop barking, this is the item for you. The best dog muzzle for biting is this Baskerville rubber basket muzzle. It is one of those dog muzzles that allows drinking, eating and panting while preventing the dog from biting. 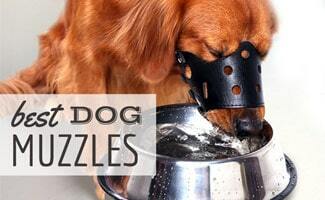 This is an excellent muzzle to use while socializing your dog safely. It is incredibly durable and can be heated and shaped to fit your dog’s snout perfectly. The muzzle has an attachment loop to slip your dog’s regular collar through as an extra precaution. Some buyers have complained that the muzzle runs a little small. So, if your dog is between sizes, purchase the size up. Also, customers have stated this is an excellent dog muzzle for pit bulls. This set of dog muzzles includes five different sizes to cover puppy muzzle to small dog muzzle to large dog muzzle. 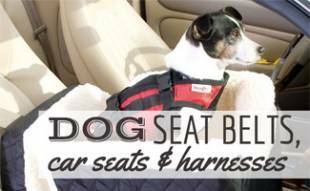 It is perfect for those of you with multiple dogs or with young dogs that might outgrow a muzzle. This set is also a great option for groomers that groom all sizes of dogs. These soft dog muzzles are made of lightweight breathable nylon. These muzzles prevent your dog from eating things he shouldn’t. They also stop barking and biting. The Gentle Leader is easy to use on walks because you have full control of your dog’s head and where their attention is. Instead of walking ahead of you (like many dogs do), this head harness (which is designed like a muzzle) keeps your dog at your side. The Gentle Leader No-Pull Headcollar stops your dog from pulling, lunging, jumping and barking. It is easy to adjust and allows your dog to pant comfortably. I use this on my dog, Sally, and it has helped lessen her barking/whining when we pass another dog on our walk. We’d like to note that PetSafe states that this is not a muzzle, however, we think it’s close enough, and it works great for helping your dog behave better on walks. How Do You Put A Muzzle On A Dog? If your dog is aggressive, it’s important to know how to properly put a muzzle on them. 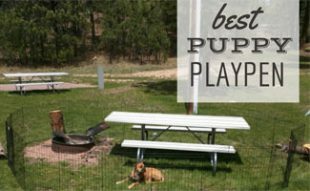 You don’t want to get yourself bitten when attempting to prevent your dog from biting others. The video below shows how to fit a muzzle on a dog who is aggressive. In the video, he is using a Baskerville muzzle which is a brand we reviewed above. Does Your Dog Have Aggressive Behavior? Sometimes a muzzle doesn’t fix every issue. 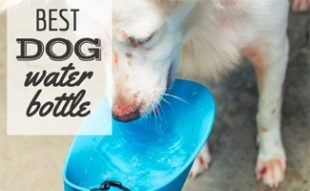 You may need to try some other things to help stop your dog’s aggressive tendencies. Check out these aggressive dog training tips if you need more help with an aggressive dog. How do you think a muzzle will help your dog?